Gabby continues to do well. She ate all of her mac n cheese last night and polished off another chocolate milk before heading to the playroom in her red wagon to play with a few toys. When we returned she took her medication and settled in to watch some Elmo and Abby Cadabby which eventually put her to sleep. She didn’t have Tylenol before bed and woke up at 1:00ish with pain, fever, and an itchy hot head. We gave her Tylenol and benadryl and then she said “Eat!”. She drank more chocolate milk and scarfed down at least 6 packages of saltines. I think the steroids are kicking in. This morning I began giving her a bed bath and she became very cranky and irritable again which I assumed meant she was hurting. After giving Tylenol she was in much better spirits. She ate a waffle, cheerios, and washed it all down with more chocolate milk. She is presently watching cartoons with Elmo and looks like she’s getting sleepy. I’m so glad to hear she made it through well. We’ve been praying for her to make a speady recovery. She is an amazing little girl. I’ll keep looking for updates. We can’t wait to see you both when you get back. Wow – amazing. I can’t believe she’s only taking tylenol – fingers are crossed over here!! Everything sounds good! Thank you, God! Glad Gaby’s surgery went so well and that she’s making such a wonderful recovery! We had a Mass said for her on Saturday, and Sister Teresa Ann and the nuns pray for Gaby every day. You are all in our prayers, and we look forward to seeing you next week. 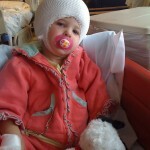 We are thrilled that Gabby is doing so incredibly well! I lit a candle for her in church on Sunday. Steve and I continue to pray that she will have a quick recovery and a successful outcome. Hey Kelly. So good to hear Gabby is doing so well! Praying for continued success! Can’t wait to see you guys back at SMILE! Let us know if there is anything we can do to help! Thanks for all the pictures and updates. Praise God for the good recovery reports! Thanks so much for the updates. We will continue to pray for Gabby and you all as you journey though this. Praising God for all His healing and comfort. I am so amazed at your precious little one. She is such a trooper. You all are. Walking this journey with such Grace. God is certainly encouraging me through it. Love to all. 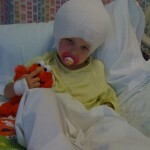 Chocolate milk and Elmo: Daily life details after brain surgery. The contrast puts me in a state of awe. I’ll never be the same again. I’m so glad we know you and get to be a part of this era of life. Thank you for all the updates. We are happy for her healthy appetite and her good recovery. You are in our prayers. I am so glad Gabby came through the surgery so well. She has a good appetite and that shows she is doing great. I am praying for her and your family. Gabby is a tough little girl.